16-year-boy Chang Bingyu from China has now become the World Men Snooker Champion. 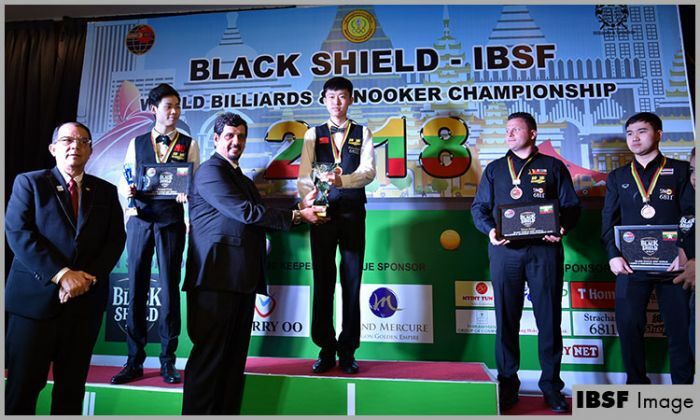 Today in the final played at Grand Mercure Hotel in Yangon, Myanmar, he defeated his compatriot and current World Under-18 Champion, He Guoqiang 8-3 to lift the title. With this victory Chang has also taken a sweet revenge from He Guoqiant for his 2-4 loss in World Under-18 semi final held at Jinan this year. Chang mesmerized everyone with his superfine performance throughout the championship. In today’s match also, he had taken over full control and made three fierce breaks of 50, 64 and 130 to lead 3-0 and then raised it to 5-2 at interval imposing another break of 56 in seventh frame. The second session resumes at 2:30 PM local time and Chang pocketed one more frame. Though Guoqiang sent a break of 126 points clearance to score one more frame but next two frames were mere formality and Chang won 8-3.